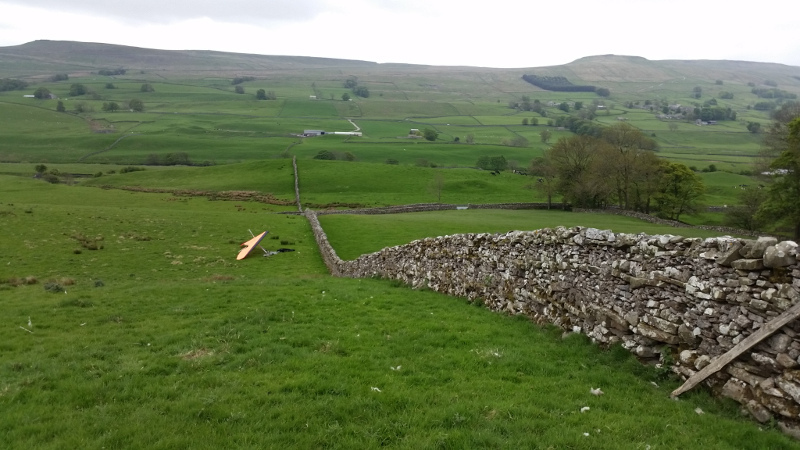 Five days of a hang-gliding competition in rainy Yorkshire, and nothing went amazingly right either. Where was that easy XC soaring conditions that we were promised? Even so, the proper champions managed to fly 60, 70, 80kms on days when I got too low and had to land. 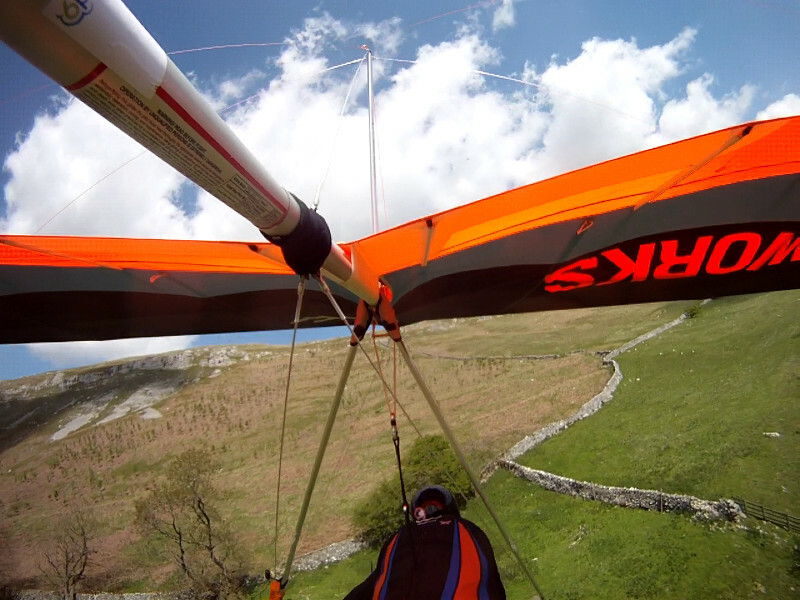 In this instance, I packed up, carried the glider back up to the top of the hill for a back-breaking two hours of frustration, rigged alone, did a dodgy self-launch into late in the day filthy conditions and only then noticed that the base-bar was sticky. I was bleeding all over it from a slashed flap of skin on my forefinger with no recollection of how it got that way. No one can fault me for lack of effort. Becka joined me for the last few days, including one where competition was canceled and there was some free-flying. I missed the one chance in a decade to persuade her to take a tandem flight that was available. Bugger. 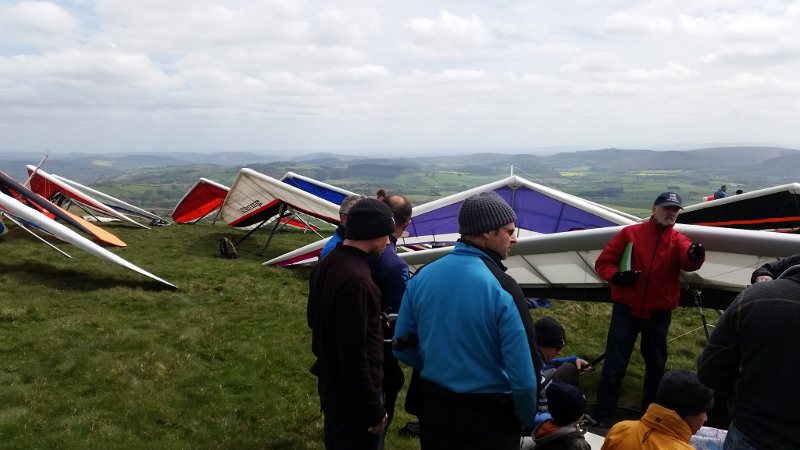 Then there was another day of competition, where I spent 3 hours in the air among a wheeling massing gliders, failing the get anywhere, though quite surprised I didn’t hit anything. The crop thinned out towards the end when I was forced to land by the strengthening wind. And then, on the final day, when the wind was completely off and the clouds were dark and low, three of us club-class competitors realized we had to do at least something, and all came off the end of the hill (seen on the horizon on the right) and bee-lined right across the valley to a field by a road. Turned out not to be scary at all. Should have done it earlier. The question is: Is it be possible to measure the temperature of the air in a thermal from a hang-glider? A really good fast responsive thermometer that isn’t degraded by noise is probably going to be useful. 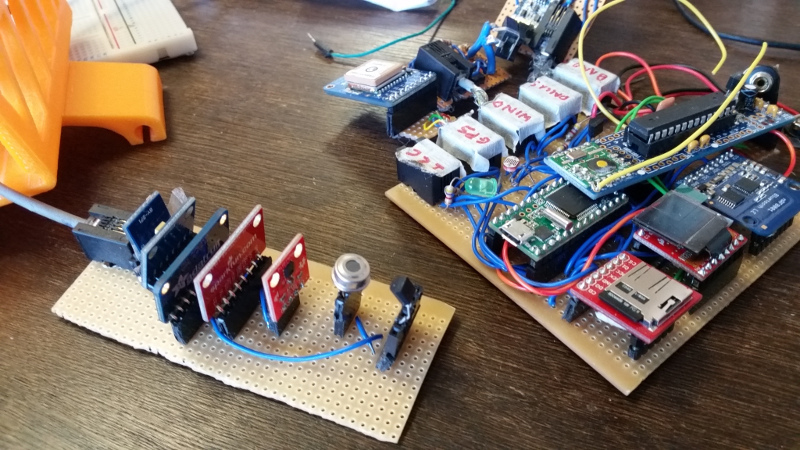 Last year I discovered interference issues with the barometric sensor, which I solved by stashing the sensor on a separate board with its own microcontroller and power supply and communicating back via an optocoupler in a way no electrical engineer would find acceptable. 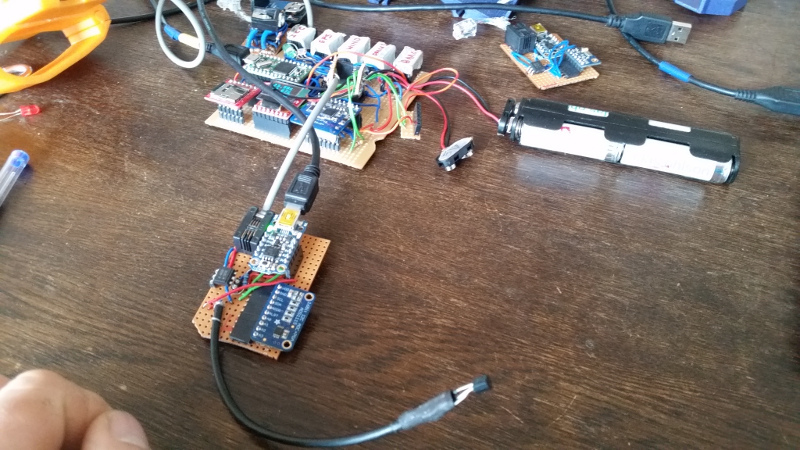 Now I have finally got an understanding of the noise visible on my accurate temperature sensing system based on an analog TMP36 wired to a 16 bit analog-to-digital converter. Those fridge temperature samples were smoothed by filtering for the maximum value across a sample window, owing to the observation that all the errors occurred downwards. I had thought that this was an artifact of the ADC device where it would tend to get the final bits of the conversion undervalues. But it’s clearly due to various other sensor devices switching on briefly many times a second, causing a voltage drop as they draw their power, and my ADC detecting these fluctuations rather than any changes in temperature. Here is the graph of my temperature readings over part of this window. See how my yellow line of accurate readings (at the precision of 0.003degC) gains a 0.5degC of noise when I switch all the sensors on. This is going to be of no use if I’m trying to detect the subtle temperature change due to flying through a thermal. I picked up on the Chicago Array of Things by this clip at the BBC. Here’s a screen grab of the circuit as the guy is showing off his hardware kit. I was struck by the similarity with the kit I’ve been working with and taking on my (frustratingly infrequent) hang-gliding flights. It shouldn’t be a surprise that they look the same. All we’ve done is bought all the cheap mini sensors we can buy and soldered them together onto one board. The Chicago group make a big thing about the beauty of their hardware box design, which it is. But what do you DOOOO with the data? This is the question I posed to the Barcelona SmartCitizen Sensor Kit whom I saw at the MakerFaire in Newcastle a couple of weeks ago. The answer was the usual: we put the data on the internet so that anyone can download and do whatever they want with it. 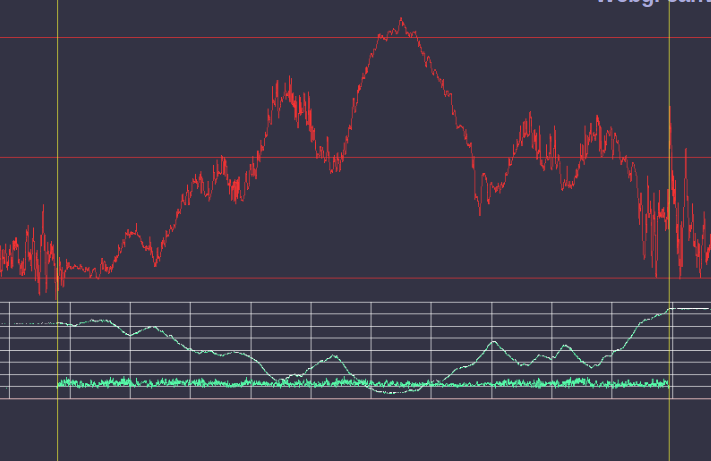 I have to harangue because I am on constantly on the lookout for techniques and people who are where I’m at with this type of sensor data. There are no adequate tools. I am constantly hacking different trials and plots of the data using bare Python and discovering all sorts of things that are important. For example, I don’t think these sensors are quite right. The digital compass needs calibration every time you plug it in, and the accelerometer was biased in one of its planes. And here is the graph of the humidity in RED, windspeed is the horizontal green squiggly line, and barometric pressure is the white line. 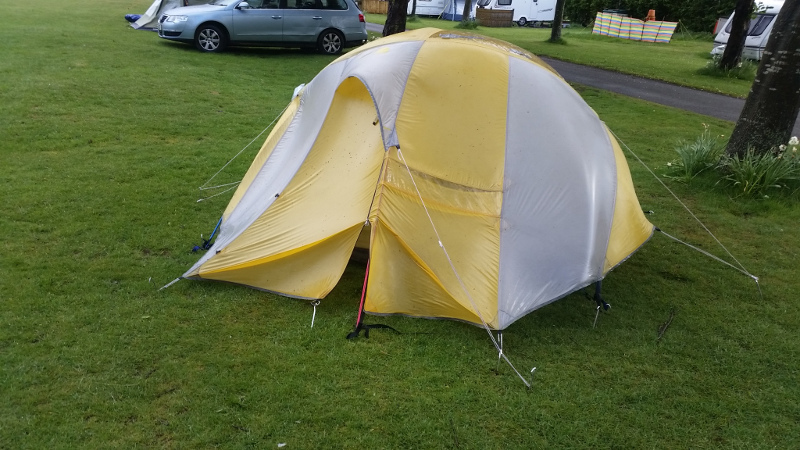 The humidity only got to 90%, having started at 70%, which means I only got 2/3rds of the way to cloudbase. Note how as the barometric readings go down (with altitude), humidity is going up, because the air temperature (not displayed) is getting colder and approaching the dewpoint. The humidity value is waving about all over the place, and then it settles down as soon as I take off (at the vertical yellow line). Then it begins waving around everywhere before I come in to land 50minutes later (the vertical lines are at 5minute intervals). I don’t know the reason for this. Is it the windspeed? Is it the proximity to the ground? My experiments on a bicycle have been inconclusive, not least because the vibration of the road tends to shake many of the components loose. And I can’t peddle fast enough. You can tell immediately that there’s a lot more to getting something useful from these devices than simply taking the digital readings and assuming it’s the truth. We had this problem in cave surveying when digital compasses and clinos came about, and people made totally buggered up mistakes and wildly out of calibration cockups that they never would have done with a mechanical instrument. Just because it’s an electronic number you tend to want to write it down to two decimal places in degrees. But if you were using the analog compass you might have actually noticed the way it swings when you hold your helmet light or steel karabiner too close enough to it to affect the magnetic field. We like these digital devices because we don’t need to think. Just put the uncalibrated values on the internet and hope that someone else can do the thinking for you. I will only know that these sensor folks are on the same page as me when they get desperate and one day nail every single sensor node they own onto the same lamp-post in order to see to what extent they agree at all. And then I’d like to see the existence of some software that is actually able to correlate the measurements between the different devices to account for their variability. That’s my demand. It’s what I call “Test Driven Development”, except the Tests are lavished on actual real things that matter which you don’t know about (such as the repeatability of these measurements), not on pointlessly obvious-when-they-fail bits of self-contained code. That’s the kind of TDD I won’t truck with when I am lost in a sea of uncertainty as to what is to be done. For months I am having to do the equivalent of programming doodling and sketching of ideas. Not possible to produce any finished artwork design. Well, aside from losing the extra day at the beginning by being directed to the wrong hill while everyone flew in the Malverns, then two days of fog and drizzle in the camp site with a leaky groundsheet, and the day after the good one with its 40mph winds that exploded my UV-damaged tent that was then rolled up and shoved dripping into the back of the car minus several items that blew away without my noticing, my single 51 minute flight 7km downwind of Bache Hill as part of the British Open Series competition was not an unmitigated failure. I suffer for my sport. Becka says I should do more caving, because that’s a sensible sport. You can schedule 7 hours of caving any day of the week you like, go down the hole, and that’s exactly at least as much as you will experience. Hardly ever a disappointment. Call me picky, but I won’t be satisfied by 7 hours down the same old muddy wormholes every weekend, just as I can’t be satisfied by a bale of grass for breakfast. I’m not a horse. It’s not a digestible substance except as part of a balanced diet with many other things. Here’s a picture from the hill on the day. The gopro SD card lost its read-only tag and didn’t work, so I don’t have any pictures from the sky. My head is still spinning. Back in the old days when hang-gliding was actually popular (and I was a student with a crap glider that I flew crappily), these competitions were exclusive affairs, where only the top elite pilots from each club were allowed to darken the skies above the playing field. Nowadays, they need more newbies, so they’ve established a “club class” with a special easy task, and go to great lengths to make you feel welcome to have a go. They’ve even arranged special retrieve car for us noobs, knowing that we’re not in the position to organize our own. I mean, we all like to think that we have the potential to do some amazing XC, but it isn’t realistic. But it could happen. And then you’d lean on some friend to be your retrieve driver for the week, and only ever get as far as the bottom landing field, causing immense humiliation in the eyes of the person who’s just wasted their holiday not being required for something that could only have been important if you weren’t so damn big-headed and useless at flying. A huge part of the game is is mental attitude and negative thoughts, and the organizers are well clued up on this, thank heavens. Anyway, we drove to the hill. We were advised to take off early. The wind was off the slope blowing from the right. There were 30 gliders on the grass in front of where I’d parked. Suddenly the sky was full of them. Too many. And the wind veered back to parallel along the slope. I knew I had blown it again. Many were struggling to stay up. You could hear certain notes of concern in their voices as they talked over the radio about which end of the slope to go to before they lost it. I had fitted a helmet radio the day before, and it was like wearing stereo headphones for the first time ever. I was on another planet, leaning on to the front wires of my glider waiting to take off. I left the mic unconnected, or I might have said: “It’s one small step for a man”. A gust of wind came through. I was so spaced out I didn’t notice I’d left the ground. The funny thing about the flight is I don’t remember any wind during the whole experience, until I landed in a field full of sheep and lambs. Then it was blowing a gale. 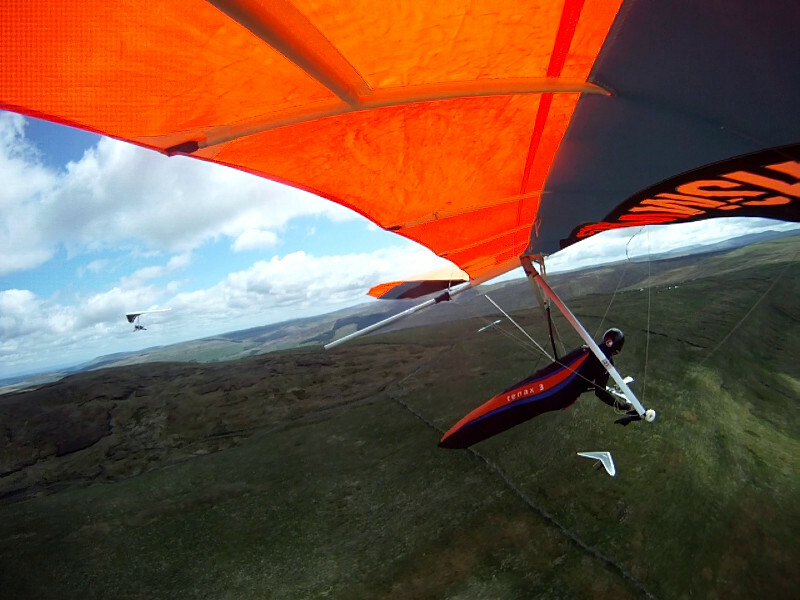 It was a joy to fly in the gaggle of gliders. They said you really only had to worry about the two or three gliders at your altitude. 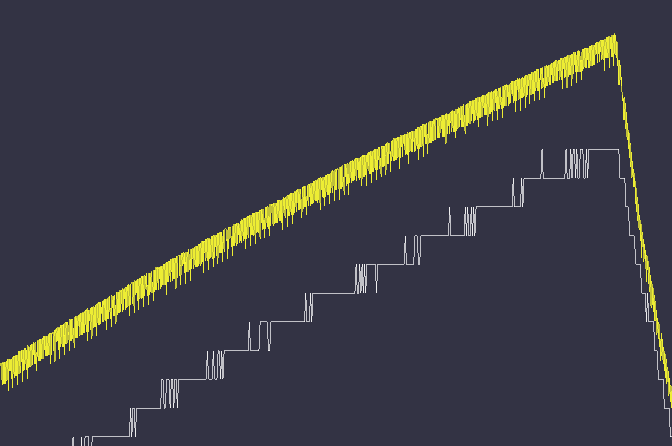 These are all top pilots, all doing the same thing (going up and not going down), all turning in the same direction. Eventually, after wallowing close to the bracken several times, I got up high, 500m above take-off, to an altitude that the earlier pilots had spoken of reaching, and I continued circling over the trees and the back of the hill. Everyone else rose above me and I lost track of where the heck they were. Then I lost the thermal, drifted downwind a bit, found another thermal, didn’t cling on to it with all my might, lost that, and came down at the high point of a hill to avoid descending into a one of the many narrow valley where it looked like there would be nowhere to land. Two gliders passed overhead like flyspecks while I was packing up. They travelled in long straight lines to find their elusive thermals, and one of them circled until it hit the clouds. The worked calculation of how far short I was out from cloudbase by will be included in the next blogpost after I have completed more analysis of the data.